I was a wife struggling with postpartum depression. When I was pregnant with my second child, anxiety, pregnancy hormones, and never-ending “morning” sickness spiralled me into a funk that I just couldn’t shake. I felt disconnected from my pregnancy, and was worried about my ability to form a connection with my baby. On top of everything, I felt like I was failing my oldest son, who needed my attention to know that he wasn’t being replaced by the new baby. Mom guilt is REAL, and it is so ugly. After the new baby’s arrival, the black cloud that I thought would dissipate on its own lingered. My anxiety manifested with me not wanting to be touched, which does not work well with the demands of a newborn baby. Despite my hope, snuggles with my new little bundle of joy didn’t make me feel any better. I was at my breaking point. Luckily, my husband was able to spot that something was not right and urged me to seek help. It wasn’t an easy conversation, and it took quite a long time for me to work up the courage to take his advice. But with the help of my doctor and loved ones, I was able to find my way back to the sunshine. In the thick of it all though, there are a few things that I wish I could have told my husband. 1. Encourage me to talk to someone! Whether it is to you, my friends, my doctor, or anyone. I know I said I don’t want to, and I know I said nothing is wrong, but it’s obvious something is wrong. I might not be able to put my finger on it, but if you ask the right questions to get me talking, it all just might come pouring out. Encourage it early and often, as soon as you start seeing the signs. One of my biggest regrets is that I didn’t address it sooner, and I lost precious time connecting with my baby that I can never get back. 2. My struggle, is not about you. The most frustrating question I got while I was struggling was “what’s wrong?” because nothing and everything was wrong all at the same time. Our life was exactly how we wanted it to be and we could not have been more blessed – two healthy happy boys, great marriage, good jobs, nice home. And I knew that. But there was a block inside me, something that would never let me fully connect with all these great things surrounding me. It was never about anything you weren’t doing or could do better – you are amazing – it was me. I know you carried a lot of guilt and wondered often why I was unhappy, and I wish I had the strength to tell you every day it wasn’t you. 3. Please, be patient with me. In general this is a good rule of thumb for any partnership, but there will be times in your life where one partner will need to give a little more. This is your time – please give it all you’ve got – because I am really struggling. 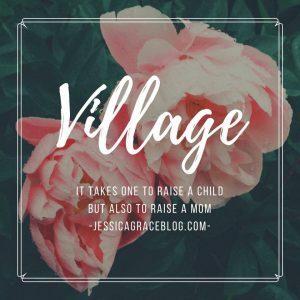 I wanted SO BADLY to give my family more, and I tried like hell to hide behind my role as a mom and to just give give give because I felt that I was failing them. But I had nothing left to give. Know that I want to be a better wife and a better mom, I just can’t until something inside of me gets fixed. 4. Thank you, I love you. Thank you for paying attention and recognizing that I was struggling. Thank you for encouraging me to get help. Thank you for picking up the slack with the kids when it all felt so overwhelming to me. Thank you for ordering take out when I just couldn’t seem to pull it together to make dinner. Thank you for being so patient with me as I tried to climb out. Thank you for loving me at my lowest. Thank you for helping me find myself again. Thank you. If you are struggling with postpartum depression, or know someone who is, join our Facebook community to join our village of parents and professionals who share their stories, provide free resources, and answer each others difficult questions. We are here for you! This is such a important topic nobody wants to talk about. Thank you it was a great reminder. Thanks Brandi!! Im so glad you found this helpful. Is there anything you would add to this list?